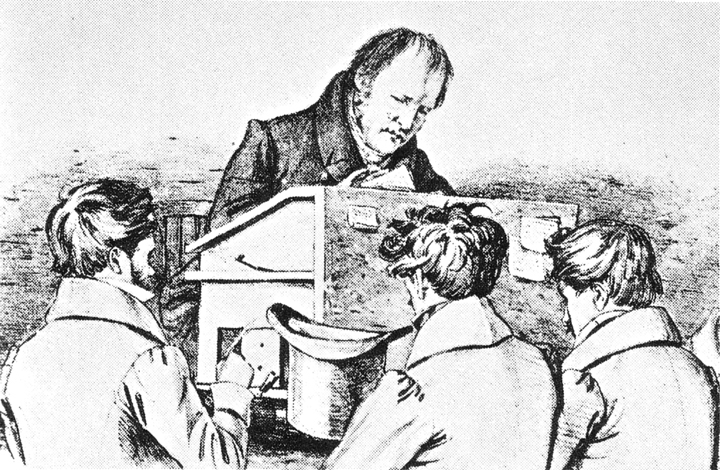 “Hegel am Katheder [Hegel teaching his pupils],” lithograph, 1828 by F. Kluger. Schiller Nationalmuseum Marbach am Neckar; via Wikimedia Commons. The towering German idealist philosopher Georg Wilhelm Friedrich Hegel died in Berlin in November 1831. The following year Eduard Gans made an impassioned defense of his erstwhile mentor's political philosophy in the preface to a new edition of Elements of the Philosophy of Right (1821), Hegel's most elaborate statement of his conception of "the state." Gans pushed back against the already widespread perception that Hegel's book pandered to the reactionary regime of Restoration Prussia and insisted, on the contrary, that Hegel was a progressive thinker who understood the state as "the life of freedom in its entirety." When Gans wrote the preface to his edition of Hegel's Philosophy of Right he was a member of the law faculty at the University of Berlin, where Hegel had held the chair in philosophy from 1818 until his death. Though Gans was a brilliant legal historian, his appointment as university faculty—an official state post—was anything but straightforward. Gans received it, in fact, only after undergoing a pro forma conversion from Judaism to Christianity in 1825. Gans's conversion spelled the definitive end to the Verein für Cultur und Wissenschaft der Juden (Association for the Culture and Science of the Jews), of which Gans had been the visionary president. 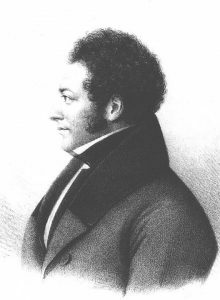 While at the helm of the Verein during the early 1820s, Gans defiantly pressed the Prussian government to appoint him—as a Jew—to the University of Berlin law faculty. At stake in these heady years was what sort of state Prussia of the post-Napoleonic era would be. Hegel and his followers—among whom Gans and most of the other active Verein members could be counted, including Ludwig Marcus, Moses Moser, and Immanuel Wolf—wanted to help shape the Prussian state according to the principles of rationality and freedom as they understood them. The Verein, which formed in 1819, eventually devoted much of its energies to a new form of secular academic Jewish scholarship; in fact, it was the Verein that came up with the name that would remain the chief term for the vibrant field of German Jewish scholarship from the early nineteenth century until the Holocaust: Wissenschaft des Judentums. For this reason, the Verein has become enshrined as one origin of academic Jewish Studies. Yet while this emplotment of the Verein in narratives of Jewish Studies' disciplinary origins is partly justified, it obscures the decidedly political aspirations of the Verein's project. Eduard Gans, lithograph, 1839, via Wikimedia Commons. For Hegel, the content of all philosophy was, ultimately, the unfolding of human freedom throughout history, culminating in the modern rational state. One of the characteristics of Hegel's thought that proved seductive to Verein members was the way Hegel privileged the agency of thinking itself in realizing freedom. For Hegel, understanding human freedom rationally was the final step in its actualization. We are not truly free until we are conscious of our freedom, and we are not truly conscious of our freedom until we know ourselves, ideally with scientific rigor, to be part of a rationally organized ethical community that allows our freedom to be substantial. The place where free human spirit arrived at such ultimate self-knowledge was, for Hegel, of course in Hegel's own philosophy (or science, Wissenschaft, as he generally referred to his own system). It was precisely the role of systematic knowledge of the workings of human freedom that Hegel thought distinguished his conception of ethical relationships from common subjective assertions of freedom that he dismissed as "abstract." One can appreciate Hegel's point: just because an individual asserts his or her own freedom does not mean that he or she is actually free in any meaningful way. One of the ironies of intellectual history is that Hegel's theory of the state would be attacked (by the "Young" or "Left" Hegelian intellectuals in the 1830s, and throughout the Marxist tradition) as hopelessly abstract, when Hegel was in fact trying to overcome abstraction and to theorize a system of ethical relationships in which subjectively felt freedom and a more objectively lived reality would mirror and mutually support each other. Hegel was indeed a relentless critic of what he took to be assertions of abstract subjectivity, and one of the key threats he saw to the higher rational freedom of the state came in the form of religious groups that privileged irrational faith over universal reason. Hegel saw in such groups a recalcitrant subjectivity asserting pseudofreedom against the rationality that, for him, was the true essence of free human spirit and ethical community. In various writings and lectures, Hegel therefore proposed what he called a philosophy or science of religion—Wissenschaft der Religion—as a rational corrective to the corrosive irrationalism of overly "subjective" religious groups. Such a science or Wissenschaft of religion would lay bare the rational core in religious ideas so that religiosity could serve as a foundation of, rather than a threat to, the higher substantive rationality of the state. Gans almost certainly had this political function of a Hegelian Wissenschaft der Religion in mind when he coined the term Wissenschaft des Judentums. A potent mixture of naïveté, hubris, and Hegelian theory allowed the Verein intellectuals to fashion themselves as citizens of Hegel's state and indeed even as civil servants in that state's service, even though they remained at a far remove from any real position of power. Neither the reactionaries consolidating power in Restoration Prussia nor the Berlin Jewish community had much use for the intricacies of Hegelian political theory. Fittingly, the law, issued in August 1822, definitively barring Jews from service in the "German-Christian" Prussian state, after this question had been left ambiguous by the Edict of Emancipation promulgated in 1812, during the short-lived era of progressive Prussian reform, is to this day referred to as the "Lex Gans." Yet ultimately the problem was not that the young intellectuals of the Verein found it impossible to integrate themselves and the Jewish community as they theorized it into Hegel's state understood as, in Gans's later phrase, "the life of freedom in its entirety." Rather, the problem was that it was only into Hegel's state that they could find entrance. Opportunities for achieving freedom as Jews in the actually existing Prussian state proved bleaker. Sven-Erik Rose is associate professor of German and Comparative Literature at the University of California, Davis. This essay draws on his book Jewish Philosophical Politics in Germany, 1789–1848 (Brandeis University Press, 2014), which received the 2015 Jordan Schnitzer Book Award for Philosophy and Jewish Thought. His current book project, The Holocaust and the Archive, examines two understudied bodies of Holocaust writing: texts by Jews confined in Nazi ghettos and Holocaust survivor testimony collected in WWII's immediate aftermath.